Everyone seems to be roasting their cauliflowers at the moment, so here I am getting in on the act. Roasting cauliflower gives it the most beautifully deep flavour, which works a treat with the smoky paprika and tasty cheeses I’ve used in this soup. I opted for a couple of different cheeses; a mature Cheddar and a tangy Lancashire cheese – two of my favourites, but you can experiment with any strong, hard cheese. It might not be the prettiest bowlful, but all my family love this soup. The ingredients are simple yet it tastes rich and luxurious. And it’s an ideal way of encouraging people who don’t usually appreciate cauliflower to give it a try. Place the onion quarters and cauliflower florets into a roasting tin. Drizzle with the olive oil and sprinkle over the paprika. Mix with your hands to make sure the onion and cauliflower are well covered. Roast in the oven for 20 minutes, until the cauliflower is browned. Pour the hot stock into a large pan and add the cauliflower and onion. Bring to a simmer and cook for around 10 minutes. Take the pan off the heat and stir in the grated cheese. Use a hand blender to puree until smooth. Taste and season if required. I am entering this soup into the following challenges: The Spice Trail (hosted by me), where the theme this month is paprika; Family Foodies (hosted by me and Eat Your Veg) where the theme is hidden goodies; No Croutons Required (hosted by Lisa’s Kitchen and Tinned Tomatoes); Cheese Please! (hosted by Fromage Homage) where it’s all about Comfort Food & Winter Warmers; and Simple and in Season (hosted by Ren Behan). Sounds really yummy. I love making soup and this is definitely one for me to make. Thanks Julie. Let me know what you think if you do try it! YUM! I bet that tastes heavenly! Thanks Deena – definitely a winter warmer! Thanks Ren – your soup sounds very satisfying too! Glad to hear your son’s a cheese snob – I’d be disappointed otherwise! Sounds delicious. Thanks for sharing with NCR. I still haven’t roasted cauli either, but it’s on my list to do! Apparently sales in cauliflowers have rocketed recently with all the cauliflower rice, 5:2 diet recipes and roasting etc. Great!. And your soup sounds truly delicious, such a wonderful idea adding a little paprika to cut through the cheese a little and I love your use of Lancashire too. 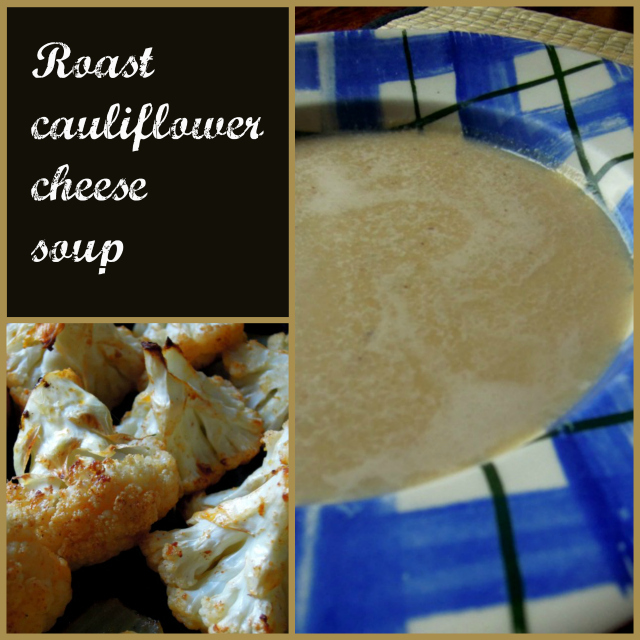 Brilliant idea to combine the flavours of cauliflower cheese in a soup. Craving a bowlful now. Sounds absolutely delicious Vanesther. I’m going to give this recipe a try. So simple yet sounds utterly delicious! Food shopping: how do you do yours?